After researching over 25 models across all price ranges from nearly half a dozen brands, and testing them we have discovered that is the best steam iron box for most people in India. 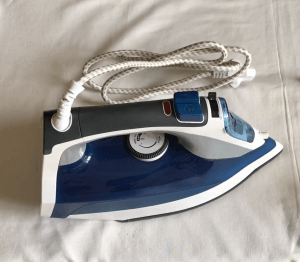 It is surprisingly lightweight for an iron of its size, easy to use but what’s best is, of course, it is quite cheap compared to other products in this category. More importantly, it has all the features necessary for ironing quickly and efficiently. We have also compiled a list of the best steam irons available in India at various price points from 1500/- to 7500/- Rs. In this price range, you can hope to get a good quality iron box with essential features that make it easy to use, safe, and comfortable. While there are some decent steam iron boxes under 1000/- Rs, the price difference definitely makes a great difference to how well an iron performs. The money you save buying a cheap steam iron would not be worth your while when they fail to live up to your expectations. 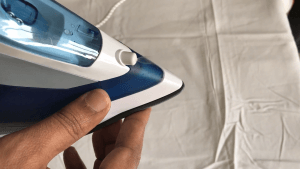 Currently, in the Indian market, the cheaper steam irons struggle to produce enough steam on a consistent basis and that might make your ironing experience a bit frustrating. So which are the top steam irons? Let’s find out. If you’re looking for a steam iron from one of the most well-known steam iron brands in India and don’t mind paying a little extra for it, might be a better fit. A better, more powerful steam iron, GC2048 can generate steam output continuously at 35g per min, particularly as it has more wattage to play with. Thanks to its steam boost function, you can blast up to 120g of steam at any time when you’re struggling with creases that won’t go away easily. Great for the price. Design-wise, it looks modern and attractive- the box we checked out was purple. Built with usability in mind, its design has good ergonomic value- the iron feels solid and is pretty comfortable to grip. It has a fairly large tank that can store nearly 270ml of water and that means you get to spend less time refilling water and more time busting creases. It might not be as lightweight as those underpowered models but it is not heavy either; it feels just about right in your hands. Not bad given the wattage it boasts of. Other than that, the design looks solid and well thought of. Like other latest steam irons in India, this one comes with a ceramic soleplate designed to glide across all sorts of fabrics. It heats up quickly and distributes steam evenly across the surface in an efficient manner through those vent holes. Non-drip is another standard feature you’ll see in many irons from different brands but Philips does it the best. And it shows. We didn’t see it leak water onto our clothes even when its temperature dropped down, which is great. And we also found the soleplate got rid of limescale quite quickly. What’s more, it has a specially constructed precision tip, and that means you can easily cut through creases in hard-to-reach areas, making it ideal for shirts and trousers. Its vertical steaming feature is useful and works nicely- which means you don’t have to draw out your ironing board for removing creases from hanging clothes, such as suits, curtains etc. Just hold the iron a couple of inches away and push the steam button. Voila. But the best thing for us is the auto shut-off feature that safely turns off the steam iron if it has been kept stationary for a while, which comes in handy when you forget to turn it off. Having said that, there are a few limitations to this Philips steam iron, too. It cannot be plugged into a standard socket since it needs a 15 amps socket which has a bigger pin than most regular power points. Backed by a 2 year Philips warranty, the GC2048 is convenient to use and does a fairly good job ironing a load of laundry. Overall, you get a lot of value for your money, if you put these small flaws aside. Looking for something cheap with similar features, the Philips GC2040 might be your best bet. Not many steam irons in India have over five hundred reviews online. This 2000 watt model from Morphy Richards does. Not bad for a product that has been around for just a couple of years now. The Super Glide from Morphy Richards is a good steam iron with a lot of nice features: it heats up quickly, gives off a good amount of steam, comes with a reasonably big 350ml water reservoir and a durable soleplate that glides across different fabrics. 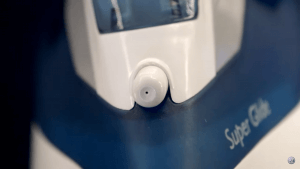 We also like that the steam iron comes with a solid two-year manufacturer warranty. It looks good in classic white and blue. The build quality is decent and the design is very thoughtful with two big buttons right at your thumb, one for spraying water and another for a quick blast of steam. And that arrangement comes in handy for those situations when you need to get more steam out in a quick span of time (i.e. when you need to keep the button pushed). Right in front of these buttons is a lever that controls the amount of steam emitted. On the body, you’ll find a typical dial that lets you choose the right temperature setting for different kinds of fabrics. Another integral part of its design, its non-stick soleplate is coated with ceramic, and sports a sharp beak design to tackle the space right between the buttons, and other areas that are generally hard to reach. And not just that, it has almost 50 vent holes evenly spaced out to distribute steam in a uniform manner. It doesn’t carry much weight, but it’s not the lightest of all either. Nevertheless, it gets the job done, even when held in a vertical position and does so without you having to apply any pressure. Such a design allows it to move smoothly over all kinds of fabrics, and that translates to more clothes ironed in a short span of time. At 2000 watts, it is not the most powerful steam iron we’ve reviewed so far, but it does outperform many models with higher wattage and price. According to Morphy Richards, the iron takes a while to reach its peak temperature, but when it gets there, it starts cranking out a good amount of steam so you can power through your pile of clothes. And, it does so, producing a steam output of 11g/min on average, which is a lot less compared to other models in this category but a decent figure nevertheless. And for times when you find it hard to iron the stubborn wrinkles in one go, the 150g turbo shot is right on tap. Overall, this Morphy Richards steam iron is well-built, safe, powerful, rightly priced, and easy to use. It’s a complete package. Highly recommended! The Philips GC4912 Azur Perfectcare is a 2400W powerful steam iron with 45g/min steam output and 180g boost function. The steam iron has an attractive design with a smart light display to alert you when you’re good to go- which is a nice bonus. At 1.75 kgs plus water, it may not be the lightest but its slim profile makes it easy to maneuver, so you can be sure you won’t be tired even after pressing a big load of laundry. The handle is large but mostly comfortable and easy to grip nevertheless. At 2.5m, the length of the cord is great, and we like that it is connected via a 180° ball to improve maneuverability and minimize tangles. That means there’s less likelihood for the cord to get in your way when you’re busy pressing clothes. And that’s one less thing to worry about- which is nice. We also like that there’s a dedicated clip to secure the end of the plug in place and that means you don’t have to tuck it in. Controls are conveniently placed at your thumb: one for water spray and one for steam shot. In addition, there is also a slider, so you can pick the right steam level for different fabrics. There isn’t any temperature control dial because it doesn’t need one- thanks to Philips’ award-winning OptimalTemp technology (more on that in a bit). Surprisingly, it has a yellow button on the left of the body for the anti-calc function- which is a relatively standard mechanism for scaling up the iron. Filling the Philips GC4912doesn’t take a lot of time. Some steam irons in this price point have narrow water holes but it’s got a bigger hole and it is difficult to miss. Just in case you miss doing it, the plastic layer around the hole is smartly designed to guide the water right through to the tank. And we liked it. The 350ml water tank is definitely on the larger side, so you don’t have to fret about refilling for every few minutes. The only complaint is that more water means more weight and the iron weighs in at 1.75kg so when the tank is full it brings it close to 2kg. This Philips steam iron is a 2400 watt monster and comes up to temperature pretty quickly than most steam irons in India. A steam output of 45g/min is no less than brilliant, and a steam boost of 180g should be just about sufficient to tackle stubborn creases. A common fixture in all mid-priced and premium irons, the anti-drip feature prevents water from leaking through vent holes even when it’s operating at low temperatures. Designed with a hard stainless steel base and special Titanium oxide coating, the 5 star rated T-ionicGlide soleplate is nice, wide and glides over laundry smoothly, offering 25% faster glide time and 25% better scratch resistance than SteamGlide soleplates. Frankly, we don’t know how that claim on paper translates to performance on board, but we are pleased with how the precisely engineered 4x Quattro tip that uniformly distributes steam across the surface. The carefully arranged vent holes allow you to get into those hard-to-reach areas and make it easier to access the space between big buttons, but we could not say the same of how well it can maneuver when ironing between smaller buttons. Philips has also paid great attention to key safety features in designing this premium steam iron. A built-in auto shut off feature puts the iron to sleep when it is left idle for a few minutes (the iron will switch off in 3 minutes when placed on its heel, and in 2 minutes when placed horizontally on its soleplate). However, for us, the biggest selling point of this Philips steam iron is the OptimalTemp, an all-in-one temperature control technology that ensures that the iron is set at a lower temperature good enough to produce the right amount of steam essential for removing wrinkles. This is so advanced that you can leave it plate-down on clothes and it’s guaranteed not to burn or leave any marks. Put simply, with just one universal temperature setting, your clothes will be totally safe meaning you can glide it across all kinds of fabrics without having to worry about spending time sorting laundry, changing the temperature on the knob or waiting for it to get to the right temperature so you can start pressing. And that means you can iron a cotton shirt one minute, and press a satin blouse the next. That’s something you’ll appreciate if you like to get through your laundry load real fast. According to Philips, this technology works by delivering a constant steam output while maintaining the most optimal temperature. And it does seem to work well if those online reviews are anything to go by. Well, it also has a couple of minor complaints. 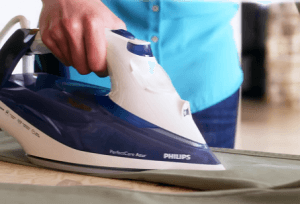 Though the iron is looking good on all counts, some reviewers complain that it needs more than a few passes to bust creases and wrinkles on some clothes. And it drinks up a lot of water at times, leaving you rushing to the tap particularly when you’re halfway into your pile of laundry. Last but not least, the lack of temperature control, which is a unique feature of this iron, might not sound much useful if you’re someone who has always turned to irons with such controls. Overall, the Philips GC4912 Azur is the most practical steam iron in this segment with great power and impressive steam performance. We strongly recommend it for those who iron quite frequently. 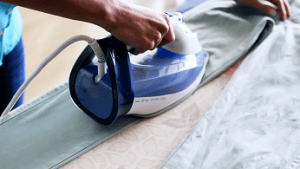 Steam irons, in general, use some sort of a combination of heat and steam to iron out creases. The prices run the gamut from less than 1000/- rs to more than 6000/- rs – the premium, top-of-the-line irons boast of more steam output and some an array of fancy features. A good steam iron will be your perfect companion if you mostly iron a fairly small load of laundry. Anyway, this buyer’s guide is aimed at helping you understand the different factors of buying a steam iron so you can decide which is the best one for you. 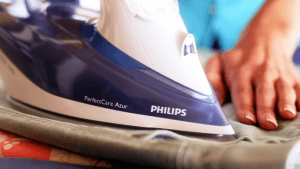 What Makes the Best Steam Iron? a pretty comfy grip and will not be too heavy to hold and press. a thin and well-shaped tapered soleplate that makes reaching into those tight pleats and hard to access areas fairly easier. 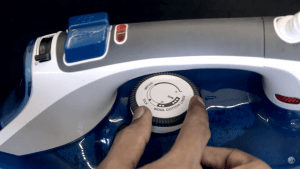 an easy-to-fill water tank that nicely locks into the body. Bonus points if it is transparent so you can read water level easily and accurately. fail-safe features so you can be sure it is absolutely safe and you can use it with confidence no matter whether you have children playing around. In reality, a single iron box in the market cannot meet all the requirements mentioned above, so think hard about what you want, browse through our list of the best steam irons available in India, and make a choice. A poorly-finished handle made from cheap materials can be a little uncomfortable to use. In most cases, these cheap handles will also have rough seams or ridges molded on their surface that could cause some sort of a discomfort in your palm, especially when you’re clasping it firmly. Use an iron with a wieldy, uncomfortable handle, and you will know what I am talking about. The best handle is not just soft but is also equally comfortable to grip (with the right dimensions) so you can hold it easily with barely any effort at all. Always consider buying a steam iron that has a see-through water tank as it can be really hard to gauge the water level on tanks that are opaque or semi-transparent. It is also important to look for irons with wider holes and clearly defined level markings to avoid situations where water flows back out as you’re filling it. These are the plates that form the base of the iron. Look for irons with a soleplate design that narrows towards the nose, because these are extremely easy to get to into tight areas such as space under the buttons. The best soleplates don’t tend to stick to your clothes and feature dedicated vent holes that distribute the steam and heat across the surface in an even manner. A soleplate made with high-quality materials is durable and gives unmatched ironing performance over an extended period of time. Speaking of materials, there is a whole variety out there. And you get what you pay for. Some cheap irons in the market have soleplates made with stainless steel. Go up the price range a bit, and you’ll find one with special non-stick coatings that are meant to help the iron glide across all kinds of fabrics smoothly. It’s commonly found in cheap irons. Even though it conducts heat quite well, it is prone to developing scratches over time. And it’s not that easy to clean. It’s not non-sticky as the materials discussed below, and as a result, may become sticky over time, causing stains and wrinkles when you iron. These are high quality. With its non-stick surface and unmatched durability, they provide superior gliding performance across all fabrics. Indeed, they distribute steam and heat efficiently as well. Besides offering great durability, they are resistant to scratches that are caused when the iron snags on buttons and zips. Soleplates made of stainless steel are at par with ceramics when it comes to distributing heat and steam evenly. However, they are not stain-resistant and tend to develop scratches if not taken care of properly. It is well worth considering. 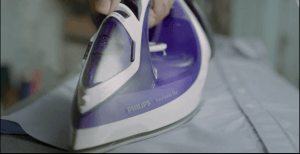 This is a useful feature that users to iron clothes that are hanging such as suits and curtains, but it’s important to note that, typically, in most steam irons, this is all about pressing the steam burst button continuously. A dedicated button that delivers a burst of steam at a fairly higher rate. It comes in handy when dealing with stubborn creases. Almost all top steam irons in the Indian market have one sitting atop the front of the handle. A dedicated water spray button is seen in the front of the handle. Upon pushing it, water gets sprayed on the fabric, thus moistening it. The amount of steam that comes out of your iron is directly proportional to the buildup of calcium over time. This is why most good steam irons available in India come with an inbuilt anti-calc scale filter. As you’d expect, you have to pay a little extra for such features, but it really pays for itself in the long term. Tests performed by consumer research agencies show that steam irons tend to develop a lot of scale buildup fairly quickly. And that means you are doing yourself a favor by looking for irons with scale filter. 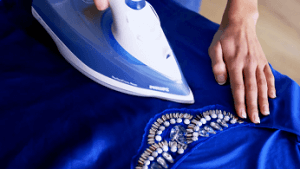 It is an essential safety feature most commonly found in the top of the line steam irons. 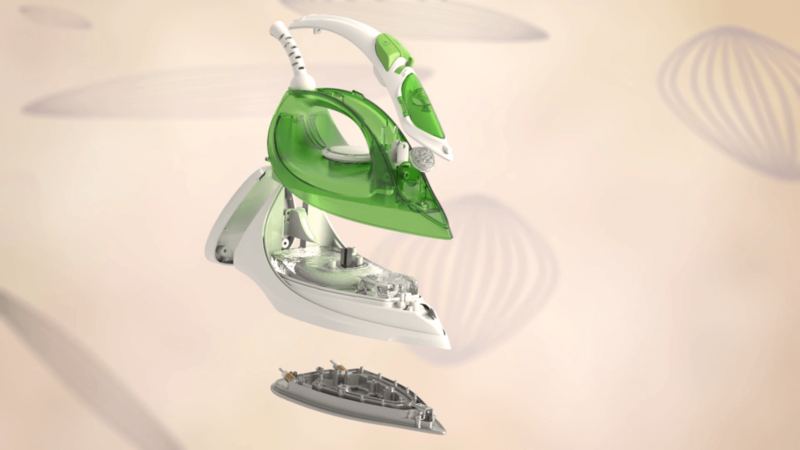 With this feature, you really need not worry about switching off your iron after using it. The iron turns off by itself once it has been left idle for a while, and this idle period of time varies from one position to another. Typically, after 6 or 7 minutes in an idle state when placed on its heel and no more than 30 seconds when kept face down.